This time last year, the Office of Scholarly Communication at Cambridge University had been in existence for one week. As the inaugural Head of the Office, I had landed in the UK from Australia on 1 January, and was still battling jet lag. What a difference a year makes. This blog is a short run down of what has happened in 2015 and a brief peek into our plans for 2016. The OSC has three primary foci – managing compliance with funders, external engagement and working with the Cambridge community to ensure awareness of broader scholarly communication issues. In our spare time we have also taken on a few projects. The University of Cambridge is engaging its research community with open access with a broad approach, both offering solutions for compliance management and determining ways in which the community can continue their normative communication behaviours while increasing access to their research. As with all universities in the UK, the Open Access service is managing multiple and conflicting open access policies in a complex publishing landscape. The RCUK open access policy has been in effect since April 2013, and the COAF policy continues the longstanding Wellcome Trust open access policy. In all the OSC manages annual funds from these of approximately £2 million to support open access compliance. HEFCE announced its upcoming open access REF policy in March 2014. In October 2014 the University introduced a user experience evidence-based new system for compliance with the tag line “Accepted for publication? Send us your manuscript“. This is a system designed to ensure that the researcher only has to act once in order to comply with multiple policies. Researchers use an attractive and simple interface where they are asked to upload their manuscript, complete a short form and submit. Our OA team then check funder and publisher policies and deposit the work in the repository for HEFCE compliance and determine the payment options required and funds available for the article, using a decision tree. The team manage the article payment processes and contact the author once the work is complete. From the author perspective this is a simple and much liked system. Outreach has included contacting departmental administrators, speaking to research communities, attending Committee meetings and so on to spread the word. Despite this, the team processes an average of 240 unique HECFE eligible papers per month, representing approximately 30% of research output. While this may be cause for concern in relation to future REF compliance, a brief analysis of the open access publication activities of Cambridge researchers indicates that 60% of Cambridge research is being made available – including through our system. We continue to have challenges relating to publishers not making articles open access under the correct licence (or even at all) despite our payment of Article Processing Charges. The checking and chasing up of these publishers is extremely time consuming. In an attempt to ensure the publishers did what we were paying for we brought in Purchase Orders for the first half of the reporting period. This has caused serious issues when it came to reporting in terms of matching the articles listed in the Open Access systems against the financial systems of the University for reporting purposes to the RCUK. As it was not making any difference to publisher behaviour we abandoned this approach. The only issues we have encountered have been for articles that are hybrid – Cambridge University (across both the RCUK and COAF funds) spends approximately 74% on hybrid journals as opposed to fully OA journals. There has been a constant reporting requirement throughout 2015, first to Jisc, then the RCUK, the Wellcome Trust and Jisc a second time. This has been a huge drain on personnel as none of the reporting periods align, requiring several months FTE equivalent’s worth of work. This is due to several issues, of which the Purchase Order problem mentioned above is a minor factor. The large number of articles that are required to be reported on in detail on an individual basis is a complex task. 2015 has been a big year for Research Data Management, with the EPSRC announcing they would start checking to ensure researchers are making their underlying data available. The Research Data Facility has spent the year focused on increasing awareness, providing support and resources, and managing data with huge success. There have been face to face meetings with over 1300 researchers, and data submissions have risen exponentially (see here for a graphic of the numbers in July 2015). The team provides Research Data Management Plan support, and the data website has had over 16,500 visits. We have spent a huge amount of time talking to the Cambridge research community. One outcome of these discussions is a deep understanding of the concerns and challenges for researchers in relation to data sharing. To address these we have provided fora for our researchers to meet with the funders to find solutions. Our meetings with EPSRC and BBSRC resolved many concerns and resulted in an endorsed set of FAQs about research data sharing. We have contributed to policy development by working with our contemporaries at many institutions to provide a coordinated response to the proposed UK Concordat on Research Data. A perennial issue with open access is the integration of systems within the institution to achieve the holy grail of ‘deposit once, use many times’. We are not there yet, although we have made good inroads. Cambridge University was one of the testbed institutions for DSpace, and the repository has been in place since 2005. The repository had suffered from a lack of attention and by the beginning of 2015 was not functioning properly and contained a large amount of bespoke coding. The upgrade of DSpace from Version 3.4 to Version 4.3 took many months because it involved an associated standardisation of the base code to ensure future upgrades will be smooth. We also needed to create a new server platform for the repository to sit in which has stabilised our operations. The repository policy has been revisited and the agreements and licenses associated with minting DOIs are now in place, and the next step is to look at integration with other University systems. We held a repository naming competition during the year, with the winning name being ‘Apollo’ – the god of logic. The new name and logo will be launched when the repository interface is upgraded in early 2016. The repository now holds 13,269 articles and manuscripts, 359 datasets and 713 working papers. In total there are more than 200,000 items held in the repository – 175,429 of these are chemical structures. Cambridge University is a large and complex many-headed beast. Engaging this community is extremely challenging. The Office of Scholarly Communication runs a large number of electronic communication channels to ensure researchers are able to stay up to date and informed about open access and research data management, including the Research Data Management website, the Office of Scholarly Communication website and the Open Access website. We send out monthly newsletters on Research Data Management to over 1000 subscribers, and at the end of 2015 launched a monthly Open Access newsletter – you can sign up here. We use Twitter extensively (see @CamOpenData, @CamOpenAccess and @dannykay68). In addition the OSC has produced a series of advocacy materials to support their work. But it is not all electronic – we have also have presented to over 1600 researchers and administrative staff during 2015 through events, presentations and workshops. Highlights have included workshops on software licensing, an Open Access week joint event with Cambridge University Press addressing the question: ‘Can society afford open access?’ (see a video summary here), and an Open Data panel discussion ‘Open Data – moving science forward or a waste of money and time?‘. The video of this event is here. This Unlocking Research blog provides information and analysis on issues relating to Scholarly Communication, Open Access, Research Data Management and Library matters. The blog is well used, with over 16,000 visits since launching. We are also active participants in the discussions held amongst our communities within and outside of the UK. There is a high level of cooperation amongst those working in the area of scholarly communication and open access. The OSC contributes to meetings and initiatives organised by the League of European Research Universities, SPARC Europe and the UK Council of Research Repositories amongst others. The OSC launched the ‘Supporting Researchers in the 21st century’ programme – aimed at library and other administrative staff – with three introductory workshops held over six weeks from May to early July. 103 people attended. Working from feedback obtained at these events the programme began offering training and workshops from late July. The Research Support Ambassador programme began as an idea of a ‘crack team’ of people who could be deployed across the University to present workshops on Scholarly Communication issues. The general philosophy was that this was a way to encourage staff across the library community and across the grade range to step up. We have taken a constructivist approach to learning – where learners take charge of their own learning. The group has worked with a mixture of self education and team work to try and develop ‘modular’ outputs that can be presented by others. There is a blog listing the progress on these topics to date here. There have been significant challenges to the process with a mixture of new material and technologies, working in teams with new colleagues and limited time. In addition they have had to self direct as the recruitment process for an Research Skills Coordinator took eight months. To the Ambassador’s credit they have stuck through a confusing process with very little direction. There is a blog post on an insider’s view of the programme here. This project is the first step to dramatically increase the number of open access theses in the repository, which stood at about 600 at the beginning of 2015. On average one in ten PhD students deposit their thesis to make it available. The repository currently does not allow any other type of thesis to be deposited. This system has meant that when a researcher requests a copy of a thesis for research purposes, the bound version needs to be scanned. In 2015 the Library held over 1200 scanned theses on an internal server. The Unlocking Theses project added all of these scanned theses held by the Library into the University repository, Apollo which now holds 2176 theses, of which 1,021 are openly accessible. The Development and Alumni Office were able to provide contact details for just over 600 of these authors. The majority of these authors have now been contacted and we have had a 35% positive response rate from them. We are in the final process of opening these theses. The remaining 1155 theses are currently held in a Restricted Theses Collection but the biographical information about these theses is searchable. Cambridge University Libraries are interested in supporting new forms of open access publishing. In 2015 a search revealed that at least seven research and 13 student self-published journals and magazines currently circulate within the Cambridge community. These range widely in quality from almost professional publications to literally photocopied pages. The Managing Cambridge Journals project is working with Cambridge University Press to offer support to Cambridge researchers who are publishing outside of the traditional channels. Three areas of potential support have been identified – a publishing platform, information and support and possibly an internal Cambridge publishing ‘brand’. Work is already underway to ingest the full decade of articles published in the Cambridge Journal of China Studies into the repository from their currently unstable home on a website. To achieve all of this has required a huge effort on many people’s behalf. 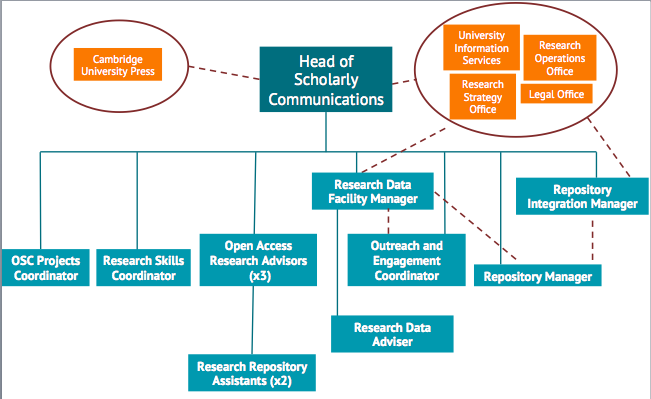 In January 2015 the OSC had three staff plus the Head – two Open Access Research Advisors and a part-time Repository Manager. Now the team sits at 12 people and this number is relatively fluid. This sounds like a huge group – which it is. But with only two exceptions – of which the Head is one – all staff are either temporary staff or on extremely short term contracts. This is primarily related to (a lack of) funding and has two effects. First, a disproportionate amount of time is spent on managing recruitment, writing job descriptions, advertising, interviewing and so on. Almost all HR requirements are still enforced regardless of the brevity of contracts – including monthly probation interviews. The second effect is the constant need to lobby for financial support which requires creating business cases, new organisational charts and many, many meetings. The Library has been nothing but supportive throughout this process, but there is a need for the broader institution to recognise that much of the work done in the OSC falls in the University rather than Library camp. Negotiation with Research Council UK funders on possible funding options for the Research Data Facility. The Communication across the Research Lifecycle project aims to join up communication with researchers by Cambridge administrative departments. This requires scoping the current communication channels and developing advocacy materials across the University administrative departments. There is currently no financial support for this project. Increase the collaboration with Cambridge University Press on the Managing Cambridge Journals project to develop this project to operational level. The second tranche of upgrades to DSpace are underway. This will involve an upgrade to V5 and implement ‘request a copy’ buttons, minting DOIs, registering the repository to wider aggregation systems and updating the look and feel of the interface. This work is expected to be completed by Easter 2016. A Repository Integration Manager will start work on the interoperability of DSpace with Symplectic and other systems in the University. New forms and simple deposit processes will be developed. Increase theses deposit by developing a new form, and amendment to the policy to allow all theses types to be deposited. Pilot with selected departments to require the deposit of a digital thesis at the same time as the printed and bound version, with the option of making the work available. Complete the first round of the Research Support Ambassador programme with some skills training and finalisation of training products before the group is released into the wild. Negotiate with arXiv and other open access providers to allow researchers to meet funder requirements within their usual communication norms. Develop a comprehensive Research Data Management training program for PhD students. Build on the Supporting Researchers in the 21st century programme. Present at conferences in the UK and abroad.